Warmer winters and changing ice conditions meant hunters were unable to bag the Pacific walrus the Savoonga residents traditionally relied on as a key food source. Three years ago, the situation became so dire, the governor declared the island an economic disaster to help loosen assistance funds. Savoonga is a small community of about 650 residents that sits on the northern edge of St. Lawrence Island, 164 miles west of Nome, in the Bering Sea. It is among the first U.S. communities to experience the effects of climate change firsthand. 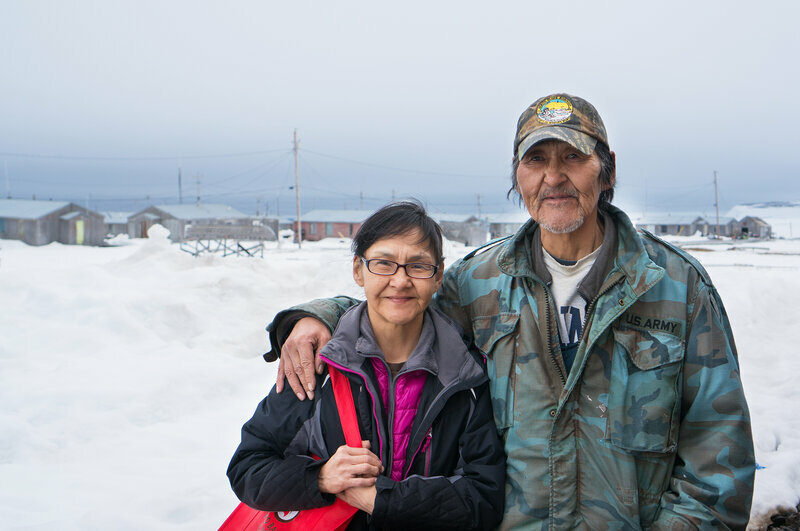 Sandra Gologergen and Wilfred Miklahook stand with the community of Savoonga, Alaska, in the background. Despite what appears to be lots of snow, Savoonga residents have been struggling with warmer-than-usual temperatures, which has led to challenging conditions for subsistence hunting. Warmer winters, early springs and a shift in typical storm patterns have hampered the ability of Alaska Native families like Gologergen’s to harvest the subsistence foods they’ve relied on for more than a millennium. The debate here isn’t over whether climate change is happening. For these rural communities, the question is whether they can continue to survive there. It’s a similar story in tiny rural Buckland, Alaska, with a population of nearly 420. Here, worries over walrus harvests are swapped for concerns about declining caribou herds. In April, the state closed caribou hunting there to non-locals. According to Feeding America’s latest Map the Meal Gap, food insecurity rates for the state hover at 14.4 percent, just above the national rate of 14 percent. But what makes the situation in Alaska different from many other states is its residents’ dependence on subsistence hunting, especially those who live in remote communities. In 2012, the state estimated that rural residents harvested a whopping 295 pounds of wild foods per person — including fish, whale, seals, sea lions, moose, caribou, birds and wild plants from berries to kelp. 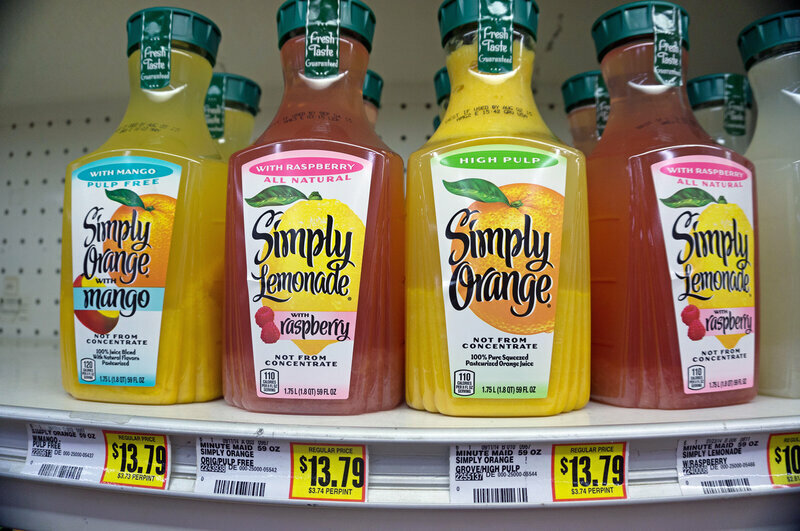 Food stamp benefits are tiered in Alaska, and rural residents can get as much as $1,227 a month for a family of four, but that assistance doesn’t go far at their small local grocers, where expensive transportation costs translate to sobering sticker prices. Milk can routinely cost $10 a gallon or more; a container of juice can run $13; a loaf of bread can cost $6; and a box of cereal can run $8. It’s a problem Cara Durr, director of public engagement for Food Bank of Alaska, a Feeding America member, has seen firsthand. Store-bought food in rural Alaska, particularly in communities not connected to the road system, is typically very expensive. A gallon of milk can cost $10, a cereal box, $8 and a can of fruit, $4. When communities receive fresh food, it is often prohibitively expensive and of poor quality. The issue is more complex than just caloric intake, purchasing power and nutrition. There’s a strong cultural factor at play as well. In a report released in December, the Inuit Circumpolar Council-Alaska and its Food Security Advisory Committee focused on how traditional foods will be affected by policymaking. But climate change has introduced umpteen hurdles. “There’s a huge safety issue, with thinning ice that people need to travel on and hunt on. And snow coverage isn’t just for transportation, but for insulation of vegetation in the winter. People’s hunting camps are lost because of erosion,” Behe says. “You have to have the right conditions to prepare the food. Efforts to get enough nutrition to these rural communities have turned into an ongoing task. On Aug. 10, the hunger nonprofit Sea Share will be shipping 14,000 pounds of frozen halibut from Kodiak, with the help of the Coast Guard, where it will then be distributed in Kotzebue and nearby villages. Behe says a millennium of experience in the region may help provide the answer in helping these communities survive climate change. “The biggest thing to know is the Inuit know how to adapt, but they need to be supported to do it,” she says.